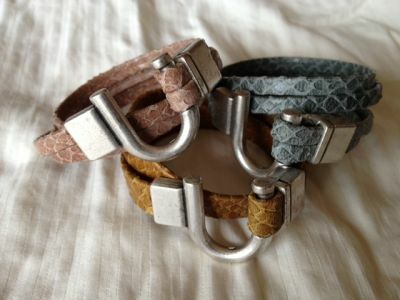 Pewter Horseshoe Clasp Leather Bracelet Discounts Apply ! Pewter horse shoe clasp with either two strands of 5mm leather (see image 2) or one strand of 10mm leather (see image 3). Available in a variety of colors and color combinations, only $30.